The UKZN’s Centre for Jazz and Popular Music will present Feya Faku and John Kordalewski (USA) in concert featuring The UKZN Big Band on May 16, 2018. Pianist John Kordalewski is best known as the leader and arranger for the Makanda Project, a 13-piece group playing previously unrecorded compositions by Makanda Ken McIntyre and featuring several of Boston and New York’s leading jazz musicians. He has worked with such notable jazz musicians as Carl Grubbs, Makanda Ken McIntyre, Ricky Ford, Oliver Lake, Andy McGhee, Webster Young, Craig Harris, Odean Pope, Billy Hart, Barry Altschul, Chico Freeman, Michael Gregory Jackson, Cab Calloway, and Charlie Rouse. For many years, he also led a trio featuring legendary Boston drummer Bobby Ward. In the 1990s, he was a core member of saxophonist Salim Washington’s nine-piece Roxbury Blues Aesthetic, which occupied a unique niche in the Boston jazz scene. He has performed in Julius Hemphill’s saxophone opera Long Tongues and directed performances of Duke Ellington’s Sacred Music. He has also participated in numerous community-based jazz education projects and led clinics at several colleges and universities. When living in Washington DC in the late 1970s, one of his important mentors was South African pianist Ndikho Xaba, who was living in the US in exile at the time. Recently, he has arranged several of Xaba’s compositions for big band, performing them with the Makanda Project as well as with the big band at the University of KwaZulu-Natal in Durban. 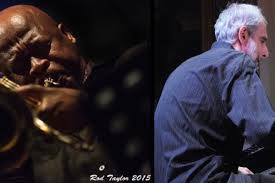 In the past year, he has also collaborated with South African trumpeter, Feya Faku, performing together in several different contexts in the USA. Fezile "Feya" Faku was born in New Brighton, Port Elizabeth, South Africa. Port Elizabeth is a town often referred to as a Jazz Academy that brought forth a great number of jazz musicians. He studied music at the then University of Natal (now UKZN) with Darius Brubeck and graduated with a University Diploma in Jazz Studies. He has performed with a great number of South African musical legends - from Barney Rachabane, Thandie Classen, Duke Makasi, Pat Matshikiza, Basel Coetzee, Winston ‘Mankunku’ Ngozi and Bheki Mseleku to Abdullah Ibrahim. Among the generation that has followed them, he is considered one of South Africa’s leading jazz musicians. In addition to leading his own groups in South Africa, Faku travels frequently to perform on international stages with global counterparts. He has participated in long-term collaborations with European musicians such as Dutch saxophonist Paul van Kemenade and Swiss drummer Dominic Egli. He has also toured the US with the South African all-star group Uhadi as well as with Zim Ngqawana and Kesivan Naidoo & The Lights. He has recorded four albums as a leader and numerous more as a sideman. Faku has participated in teaching and fellowship programmes teaching trumpet and ensemble work. In April 2006, he participated in a residency programme in Switzerland teaching and performing with the Swiss-South African Quintet. The University Council of the Nelson Mandela Metropolitan University awarded him a Council Prestige Award. In October 2012, he was Artist in Residence at the opening of the International Jazz School of the University of South Africa. UKZN Big Band features a programme that ranges from classic swing arrangements of Duke Ellington and Count Basie, great arrangements of tunes by local jazz luminaries such as Hugh Masekela and Ndiko Xaba, the funk music of Earth, Wind and Fire and student arrangements of house music stars such as Micasa and Davido. The Big Band have played Kordalewski’s arrangements of Ndikho Xaba music such as Mad Mad, Nomusa and Moon Gemini. These arrangements are imaginative, modern, and sophisticated. Kordalewski’s arrangements are highly technical and supremely musical all at once. For this concert Kordalewski has arranged two of Faku’s compositions, namely, Bandile and Song for my Fathers. The Big Band will also feature two of Ndiko’s songs as well. The UKZN Big Band has had two highly successful performances this year featuring their House Music repertoire. The band is growing in size and has truly instilled confidence in the younger players of the Band. The band features Obankeng Thamage, Tazzlo Jacob, Jaedon Daniel on piano/keyboard; Stanley Matlou, Phila Makhubu on drums; Blessing Thwala on bass; Curt Rix, Phuti Mofakeng, Sinalo Zulu, Mondli Gcaba on trumpets; Simone Van Niekerk, Nwabisa Kheswa, Zintle Msane, Tseleng Mokhatla on saxophones; Siyalo Zulu, Kgethi Nkotsi, Mthunzi Mkize on trombones and Nombusoi Ratsha, Nomthandazo Madiya and Menzi Cele on vocals. The concert takes place on May 16, 2018, at 18h00 at The Centre for Jazz and Popular Music (CJPM), Level 2, Shepstone Building at UKZN Howard College Campus. (Doors open at 17h30). General admission R80 (R50 pensioners, R25 students).